Neelan Matric. Hr. Sec. 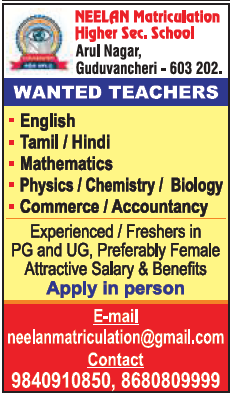 School, Guduvancheri has advertised for recruitment of Teachers jobs vacancies. Interested and eligible job aspirants are requested to apply immediately from 02nd December 2018. Check out further more details below. About School: We at NEELAN MATIC.HR.SEC.SCHOOL. seek to achieve excellence in all our pursuits. In these days of intense competition, education is one of the major areas where special emphasis is laid on all facets of school life, be it star achievements , be it star achievements , be it academics, cultural activities or games and sports..
UG / PG with or without experience. Female candidates preferred.